Add to Cart to see your unadvertised price! No obligation and no credit card needed. Navigate through all your outdoor adventures in vibrant color with the Magellan® SporTrak® Color. 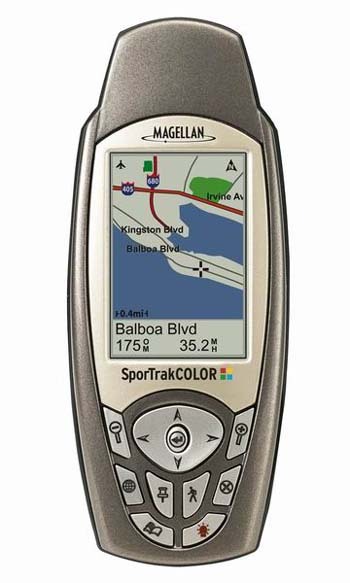 Magellan SporTrak Color provides superior tracking and accuracy, showing your position to within 3 meters, even in difficult environments such as cities or mountains. Featuring an impressive 10 MB North American or 11 MB European, built-in mapping database, SporTrak Color puts rich color maps at your fingertips. The large, high contrast, full color 240 x 160 pixel display enables you to easily find your location, heading and route. An additional 22 MB for North America or 21 MB for Europe of memory enables you to expand your mapping capabilities by uploading detailed maps from optional Magellan MapSend® software products. A clear advantage over the competition, Magellan SporTrak Color GPS also offers a built-in barometer, giving you an advance on the weather and an innovative 3-axis compass for superior navigational accuracy no matter how you hold it. Built tough, Magellan SporTrak Color GPS is waterproof and rugged enough to go with you on any adventure. The Magellan Sportrak Color GPS lets you see where you are and where you’re going in vivid color on a large 240 x 160 pixel, high contrast, full-color display. Color enables you to easily see your location and route, and to easily differentiate between roads, interstates, parks, waterways, airports and other Points of Interest at a glance. Like carrying your own little weather station, there’s no need to worry about what might be rolling in when you have your Magellan Sportrak Color at your side. A clear advantage over the competition, Magellan SporTrak Color offers an innovative 3-axis compass which orients no matter how it's held, providing added confidence. You don't need to hold the unit level like a compass or a 2-axis electronic compass (found in many GPS devices), to get an accurate reading. Hold it naturally. The Magellan SporTrak Color uses WAAS (Wide Area Augmentation System) and the European Geostationary Navigation Overlay System (EGNOS) to provide the maximum GPS accuracy and reliability available. Tracking up to 12 satellites to locate your position to within 3 meters, you can rest assured that with the SporTrak Color, you will know where you are. Start navigating right away with the impressive, 10 MB, built-in mapping database of North America or 11 MB for Europe, including highways, major roads, parks, waterways, airports, cities and marine navigation aids, such as buoys, beacons, lights and more. With the Magellan Sportrak Color GPS, you can easily expand your mapping capability by downloading detailed maps from optional Magellan MapSend software products. With the Magellan Sportrak Color GPS, you can store up to 20 routes, 500 waypoints and 2,000 track-points to easily find your way back again. The unique, Save Track-to-Route feature of the Magellan Sportrak Color GPS allows you to convert complicated track files into easy to follow routes. Save hundreds of routes by transferring them to a PC using optional Magellan MapSend software. The Magellan SporTrak Color GPS shows you when the sun will rise and set, as well as the phase of the moon, for any date and location in the world. Want to know when the fish are likely to be biting in your little corner of the world? The Magellan SporTrak Color can tell you. Monitor the GPS satellites in view and get information about their status with your Magellan Sportrak Color GPS. At a mere 6.8 oz/192.8 grams the attractive Magellan SporTrak Color is compact and lightweight enough to slip into your pocket and go with you no matter where your adventure takes you. 2 AA batteries provide up to 14 hours of continuous use. Rubber armored, impact resistant plastic allows you to confidently take the Magellan SporTrak Color on that next great adventure. SporTrak Color is sealed (to IEC-529 IPX7 specifications) – and it floats! The SporTrak Color is intuitive and easy-to-use, yet all the major functions are described in step-by-step instructions built into the unit. If you speak English, French, German, Swedish, Finnish, Spanish, Italian, Portuguese, Norwegian or Dutch, so does the Magellan SporTrak Color. Magellan states "we pride ourselves on building rugged and reliable navigation products that you can depend on, backed by a full one-year warranty in North America (2 years in Europe)". Enjoy your Magellan Sportrak Color GPS!